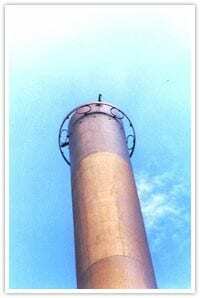 One of the most common problems encountered on a cylindrical stack is Wind Induced vibration due to Vortex Shedding. If you have never visually observed vortex shedding, watch this brief video and prepare to be amazed. There are a couple of options to address this problem, and this newsletter discusses the option of Tuned Mass Dampers (TMD). Helical strakes work by disrupting the vorticies from forming; however, a TMD solves the vibration problem by increasing the inherent structural damping in the system. A welded steel stack has very little structural damping, meaning that the vibration will take a long time to reduce the amplitude to a low amount (Underdamped in graph below). By adding a TMD we are increasing the damping to achieve something between the “Underdamped” and “Critically Damped” curves shown below. We can dynamically represent the stack itself as a Mass, spring and damper (See image to right). Similarly, the TMD is also represented by a mass, spring and damper. The TMD elements are selected in order to increase the damping on the system as a whole. There are many different types of TMD’s, but the type Meca uses is shown to the left. The mass consists of a cylinder, and the springs consist of wire rope coils which also provide the damping. The entire assembly is suspended by pendulum rods. The combination of mass, spring stiffness and pendulum length are used to “Tune” the TMD to the desired frequency. Does MecaStack design the TMD? 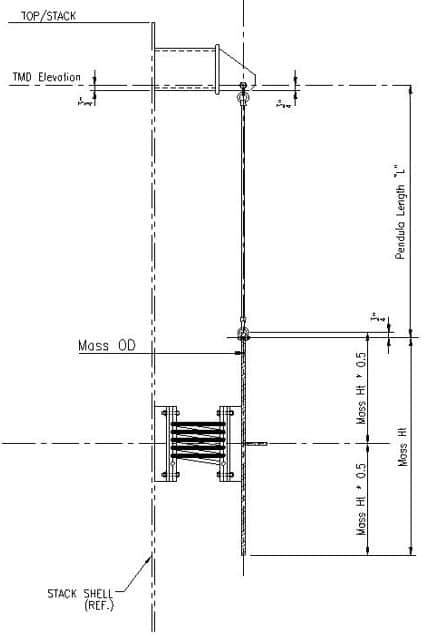 The design of a Tuned Mass Damper (TMD) is specialized, and not a simple process. Meca sells TMD’s,offers quotations for a TMD, and provides preliminary estimates of the sizing. Typically the designer sends Meca the Input file from MecaStack and then we size the TMD and provide a quote. Then we return the MecaStack file with the relevant TMD parameters included in the file. MecaStack will then use the values entered to perform the analysis. 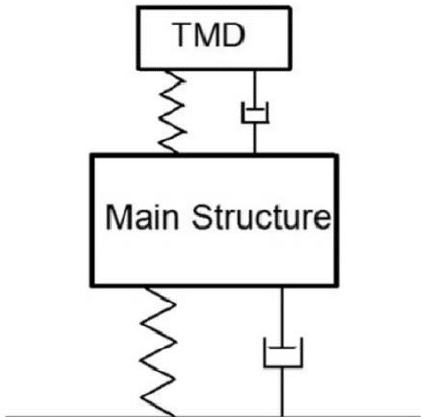 MecaStack does NOT design the TMD, it only considers the effects of the TMD, after the appropriate parameters are entered. Meca provides these parameters (structural damping, dimensions of TMD, etc.) and then you use those parameter to evaluate the impact on the stack using MecaStack. Generally a TMD becomes economically beneficial at about 150 ft [45 m]. The TMD does add a little weight and wind area, but generally these values are not significant. 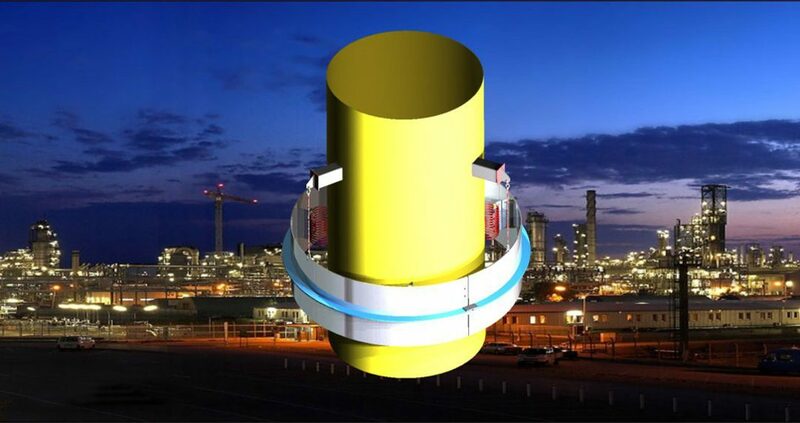 As a result you don’t have the big weight increase on the stack that you see with the addition of helical strakes, and so the weight savings on the stack offsets the cost of the TMD. If you have a stack and would like a free consultation to determine the best solution for a vortex shedding issue, please email us the input file from MecaStack (*.stk). Please let us know if there is anything we can do to assist you.